Author Sean C. Kelly has recently written a book documenting the history of the US Military presence in and around London since WWI. Included are stories from over 40 people he has interviewed who lived and worked as he did on the various US Military bases. We have invited Sean to speak to the High Wycombe Society on Friday 7th October at 7.30 p.m. at the Riverside (former British Legion building). All are welcome. There is a small charge of £2 for non-members. 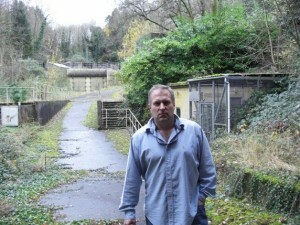 Included in his talk will be information about the history of the Daws Hill Base as well as some of the ‘mystery behind the history’ so if you’ve ever wondered what went on in the once-secret WWII and Cold War bunker at Daws Hill shown in the background of this portrait of the author, come along to find out.